Hey everyone! The spring field season is almost upon me and I won’t be able to continue posting regularly beyond the end of March – I figured I’d better warn you. However, I hope to blog regularly during my journeys, perhaps every two days or so. My first adventure will be spending 10-12 days in the Smoky Mountains in mid-April. Ted Mack will accompany me. We’re going to enjoy the wildflowers and some early spring soundscapes. After that, I’ll be heading up to the Canadian northwoods to record Loons. Finally, when June rolls around, I plan to drive all the way to the Rocky Mountains for more exciting adventures. Gurgling water with Northern Parula, White-throated Sparrow, Canada Warbler, & Ruby-crowned Kinglet. 6:15am, 13 June 1995. Adirondack Mtns., Paul Smiths, NY. Recorded by Lang Elliott. 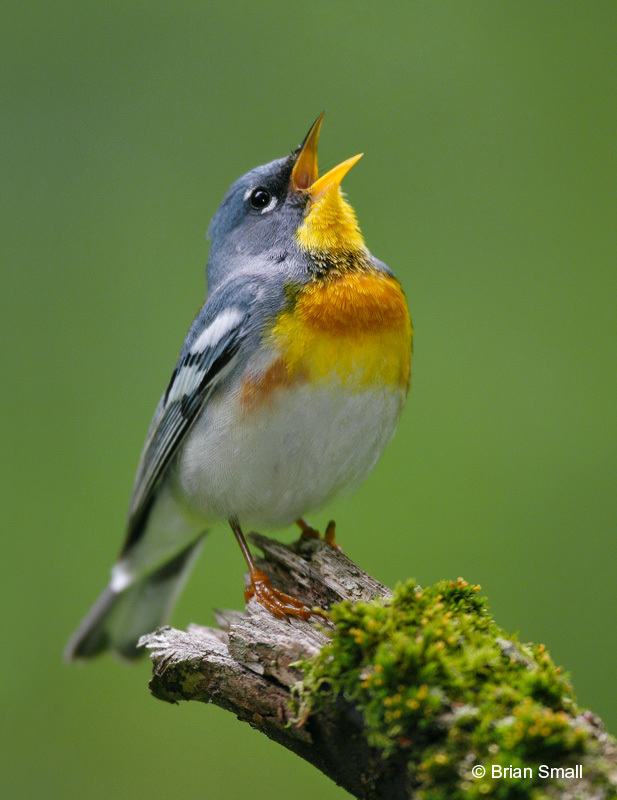 This soundscape recording could easily be categorized as “species portrait” because it emphasizes the song of the Northern Parula. Do you like it? I worked really hard to make it usable. Apparently, one microphone was going bad and it produced some high pitch tones that I’ve tried to eliminate. There were other problems as well, such as a lot of high frequency hiss in the bad channel, but I think I did a fairly good job resolving everything. Let me know what you think? Does this recording sound good to you? I really like it. I hear Canada Warblers, Ruby-Crowned Kinglets, a Red Squirrel, a Yellow-Rumped Warbler, White-Throated Sparrows, a Northern Parula, and bees. What a beautiful recording. I like the hum of the bees and the Red Squirrel chatters, and all the birds singing throughout the recording. 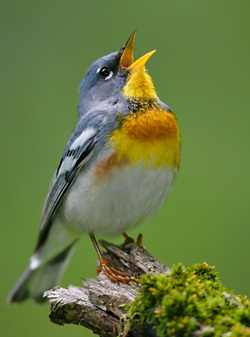 I have seen every bird mentioned but the Northern Parula, probably because I don’t live in part of its breeding range. There is a band in the Midwest where parulas are migrants-only, and I live in part of that band. I don’t understand why southern Michigan lacks breeding parulas, but basically everywhere else in the US has breeding parulas. Northern Michigan, however, does have breeding parulas but probably not as many as there are in New York. I could listen to this for an hour. I’ve admired your photography at the Easton Waterfowl Festival for several years but only recently looked at your blog and I’ve got to say I’m a big fan, you do amazing work!! Thanks for sharing and have a great trip this spring. It is beautiful day today, but the woods are very quiet. The migrants are on the move and I think many left early. Perhaps storm Irene encouraged the seemingly mass exodus in Ledyard CT. Your soundscape brings summer back, shed but weeks ago. Truly fantastic! I feel like I am out on one of my treks in Western MA or up in the North Country of NH! I could listen to this all day…..makes me yearn for Spring and Summer that much more! That is really great! You did a fine job in cleaning up all the “problems,” and now it just sounds fabulous! Definitely release this one on whatever title you have coming out, just so you release it! And good luck to you on all your adventures. Lang, this is another delight in all respects. Pleeeeeeze add this one to your Warblers At Waters (or whatever!) release. Your scapes that blend birdsong with creek riffles are so pleasing and mesmerizing in the very nicest ways. Happy trails! Hey can you hear the bees? or wasps or whatever are buzzing around too? very low pitch buzzing. Love this file! Shannon: Yes, those are either bees or flies, or both. I’ll add mention in the post.